At Paniola Ranch on Akala Island you can find the Pokémon Nursery. Here you can leave two compatible Pokémon to produce Eggs. This guide will teach you how it all works. In previous Pokémon games, Trainers could leave their Pokémon at a Pokémon Day Care to be raised and to breed. Unlike these Day Cares however, Pokémon left at the Pokémon Nursery do not gain levels. The sole purpose of the Nursery is to produce Eggs. Furthermore, the cost of retrieving a Pokémon in Day Cares varied depending on how much levels it had grown. The cost of retrieving a Pokémon from the Nursery is always 500P. Finally, at Pokémon Day Cares it was not possible to receive an Egg if you party was full. At the Nursery, you can choose to send an Egg to a PC box in that case. For example, a female Yungoos can breed with a male Yungoos, or with any male Pokémon in the Field Egg Group, like Eevee. Alternatively, breeding is usually still possible as long as one of them is Ditto, even if the other parent is genderless, and in fact, genderless Pokémon can breed only with Ditto. Pokémon in the Undiscovered Egg Group cannot breed whatsoever, and Ditto cannot breed with itself. After you have left two compatible Pokémon at the Nursery, you need to walk a certain amount of steps before an Egg is produced. 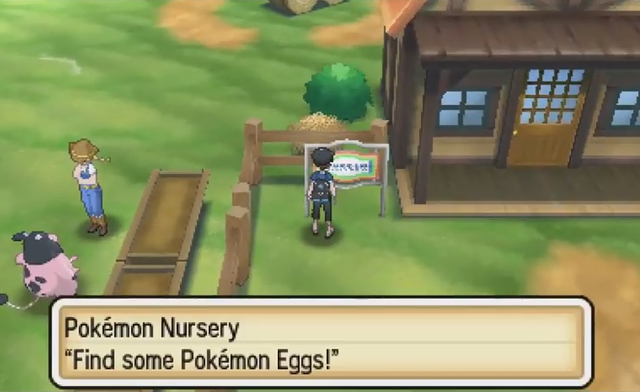 Eggs are handed out by the Pokémon Breeder in front of the Nursery, she will take on a thinking pose if she has an Egg for you. The chance of any two Pokémon producing an Egg is determined by their species (two Yungoos are the same species, while Yungoos and Gumshoos are not) and their Original Trainers. The chance is higher if the Pokémon are of the same species and also if one of them comes from another Pokémon Trainer than the player. Another way to increase the chance of getting the Egg is to have the Oval Charm in your bag. You receive this item from Morimoto after defeating him in the GAME FREAK office in Heahea City, after becoming Champion. To receive Eggs as quickly as possible, there is a neat little trick which uses Tauros Charge. Walk into the small fenced area in front of the Nursery, call Tauros from your Ride Pager, press Ⓑ to dash, and keep dashing in circles until the Pokémon Breeder changes her pose. Receive the Egg from her and go back into the fenced area to repeat the procedure. When your party is full, you will have the opportunity to send the Egg to a PC box to be retrieved and hatched later. The amount of steps needed to hatch an Egg differs per species and is mentioned on each Pokémon's page in our Pokédex. After taking enough steps, the Egg will hatch into a level 1 first-stage Pokémon of the female species' (or non-Ditto parent's) evolutionary chain. For hatching Eggs, you can use the same Tauros Charge trick as for receiving Eggs. A way to make Eggs hatch faster is to get a Pokémon with the Ability Flame Body and put it in front of your party while hatching Eggs. Pokémon with Flame Body in Sun and Moon are Magmar, Fletchinder, and Talonflame. To read more about the specifics of Pokémon breeding, please read our starter guide on Breeding Pokémon.